In my quest to use as much as possible of each sweater I do many things: first I'll cut out mittens, a hat, wrist warmers or a scarf. I can usually get a hat and a pair of mittens out of an average sweater. Then I start looking at what I'll do with the left-overs. 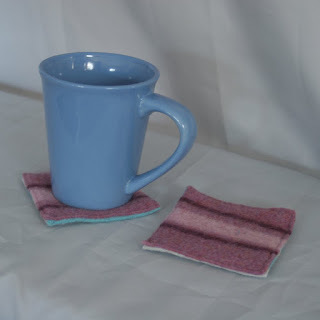 I make treasure bags (wallet-sized pouches that close with a button), tiny treasure bags - just right for the tooth fairy, and cut the felt into squares for mug rugs (coasters). After that, the big-enough scraps go into the flower bag and the smaller ones into the stuffing box. I love not wasting anything!